At some point during the Cowboy’s week 6 win in Seattle, it might have dawned on you that the Cowboys offensive line is pretty good. Indeed, the Cowboys’ linemen allowed only one sack and one QB hit on QB Tony Romo, while paving the way for 162 yards of rushing on 37 carries against a vaunted Seahawk defense that still ranks 6th in the league in Rush Yards per Game Allowed. And in light of this productivity, the announcers may have mentioned that the Cowboys have three of their own 1st round picks starting on the offensive line, LT Tyron Smith, C Travis Frederick, and RG Zach Martin. This 60% figure is tied for the highest percentage of starting offensive linemen who were 1st round picks for their current teams. The other team, ranks 7th in Rush Yards per Game, slightly behind Dallas, who sits in 1st place. If you don’t have the current team rushing rankings memorized, then I’ll be more specific; it’s the 49ers, with LT Joe Staley, LG Mike Iupati, and RT Anthony Davis. So it would probably be fair to say that these two teams invest pretty heavily in their offensive lines, but do they invest the most heavily? To quantify this I have catalogued the draft position or average annual salary of all 160 starting NFL offensive linemen, and found the average cost of acquiring a player at each position. These findings aren’t altogether shocking. I was a little surprised by the lack of investment at right tackle, considering that four of the first eleven picks of the 2013 draft played right tackle, but Eric Fisher and Luke Joeckel have switched to left tackle this year, leaving only Lane Johnson and DJ Fluker to hold down the right side. The left side of the line is obviously at a premium, particularly at tackle, which demands a strikingly different level of investment. 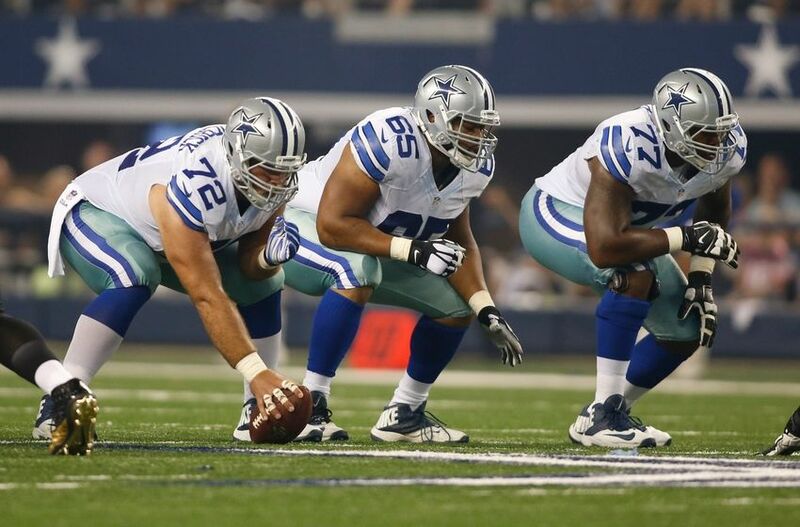 But, how does this data reflect on Dallas’ offensive line? The three first round picks are all well above the average for their positions, but LG Ronald Leary plays as an undrafted free agent, and makes less than half a million dollars. Meanwhile, RT Doug Free makes $8 Million a year following a contract extension he received while playing on the left side, but he was originally drafted in the fourth round, so Dallas has only invested above average at three spots on their line. While no team has spent above average at all five spots, four teams have actually invested above average at four of the positions: NE, TEN, CLE, WSH, ATL, DET, SEA, SF, and STL. A couple of things to note, Tennessee and Washington both spent heavily in an active free agent market for established veterans, which raises their apparent level of investment, but might not have been the wisest of personnel moves. Also, three out of the four teams in the NFC West have spent serious draft capital and cap space on their offensive lines, which has led to a very physical and competitive division. Atlanta and Detroit both anchored their lines with a first round left tackle and spent second and third round picks or handed out moderate contracts in order to build a stable if unspectacular interior. New England similarly picked LT Nate Solder in the first round, and gave out reasonable free agent contracts to their center and right guard, while picking up RT Sebastian Vollmer in the second round. Three playoff teams, the Bengals, Seahawks, and Packers were the only three teams to start five offensive linemen that they originally drafted, but the level of investment was not universally above average. The most interesting of these teams, however, is Cleveland. The Browns won their week 6 matchup with the Pittsburgh Steelers despite fielding a specialist group in which only two key contributors, Ben Tate and Jordan Cameron, were not undrafted free agents, while players such as QB Bryan Hoyer, RB Isaiah Crowell, WR Miles Austin, and WR Andrew Hawkins were passed over on their respective draft days. One key reason for the success of this “ragtag” group of ball-carriers is the impressive offensive line that opens holes in the run game, and provides Hoyer with time in the pass game. Four of the Browns starters were drafted within the top 37 picks, including perennial All Pro, Joe Thomas, who was a third overall pick. Most teams in the NFL try to find a guy like Thomas, but the browns have continued to use their draft picks to put other solid players in front of their specialists, and it definitely paid dividends on Sunday. Depending on how the player was acquired. Players still with their original draft team are entered along with their draft position, regardless of how many contracts they have signed since joining the team. If a player joined a team through free agency, then the team is primarily giving up cap space to sign the player, and they are thus entered along with their average annual salary. For trades, a player on their rookie contract counts as a draft pick, while a player who had to sign a new contract following the trade counts as the average annual salary of their new contract. There are actually more 1st round right tackles (7) than there are first round left and right guards combined (6), but there are three starting RT’s drafted in the 200’s and two more in the 160’s, while there is only one guard still playing for his original draft team that was drafted after pick 149. Washington’s three interior linemen all make between $3M and $4.25M, while Tennessee spent $7.8M on LG Andy Levitre and $5M on RT Michael Oher. It’s not at all shocking that these teams don’t have any free agents on their offensive lines, as they tend to save their cap space for resigning their own successful players.